Place the egg yolks, the caster sugar, corn flour in a bowl and mix together. Bring the milk to the boil and gradually whisk it into the egg yolk mixture. Return the mixture to the pan and whisk over a medium heat for 3-4 minutes until it thickens substantially. Transfer the mixture to a shallow tray, cover with cling film and chill in the fridge. When the mixture is cool add the Nutella using a hand whisk or stand mixer with the paddle attachment until the mixture is smooth. Put the finished cream into a piping bag. Roll out the puff pastry if necessary until the pastry is 3mm thick. Cut the puff pastry into rectangles (5cm x 3cm). Allow 3 per person. Bake the puff pastry rectangles for 12 minutes with another baking tray on top to keep them flat. When golden brown allow to cool and then dust with icing sugar and return to the oven for 5 minutes to glaze the puff pastry. Squeeze the left over orange membrane to make orange juice. Put the caster sugar into a stainless steel pan and melt, without stirring, to form a caramel. Once you have a dark caramel, add the orange juice, the segments and the Grand Marnier. 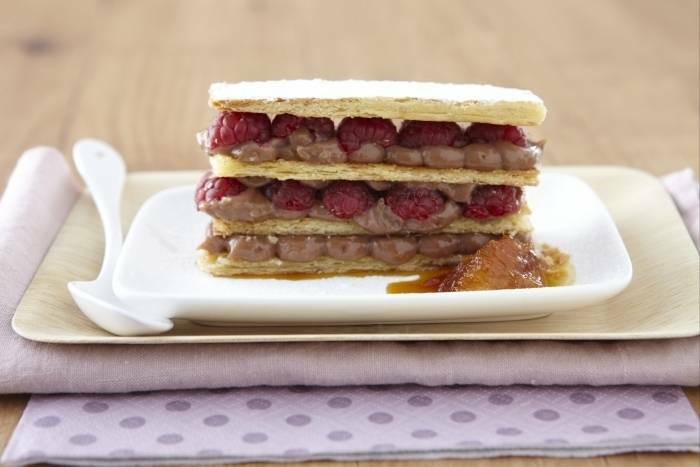 Place a puffed pastry rectangle on the plate. Pipe the nutella cream across the pastry. Add a few raspberries. Place another puffed pastry rectangle on top and repeat. Place final layer of pastry on top, dust with icing sugar and serve with a drizzle of the orange and grand-marnier sauce.